Humans never get the chance to stroll among the treetops, but now, thanks to the Wild Walk exhibit at The Wild Center, every family can take an incredible treetop journey together. The Wild Center, located in Tupper Lake, NY, is a super hands-on, all-day family attraction. From 81-acres of outdoor area to a 54,000-square-foot museum with movies and live animals, to guided canoe paddles and the amazing Wild Walk there are exhibits that will entertain, educate and amaze everyone in your clan. Keep reading to learn more about the adventurous Wild Walk trail that grants visitors a towering, epic perspective of the forest. The Wild Walk is the newest adventure at the Wild Center and it truly does allow your family to get wild. 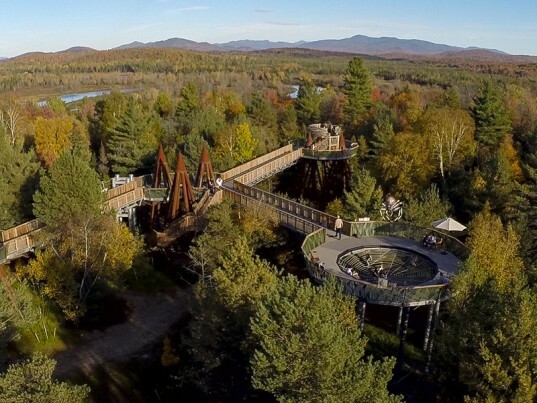 This beautiful walk takes you up, up, up high to a trail of bridges straight to the treetops of the Adirondack Forest. 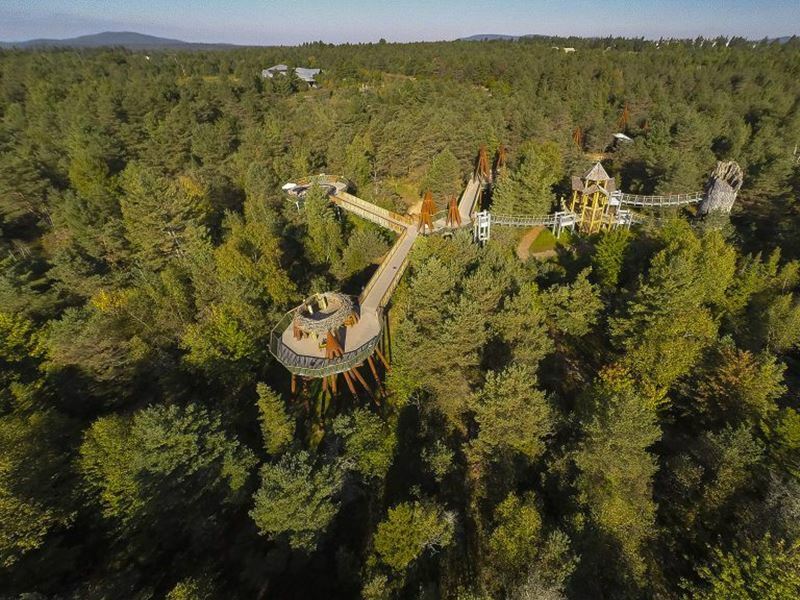 Your family can explore the world above like they never have before, gaining a bird’s eye view of nature and new perspectives on what it’s like to live among the treetops. The nest at Wild Walk is one of the most amazing attractions the park offers. 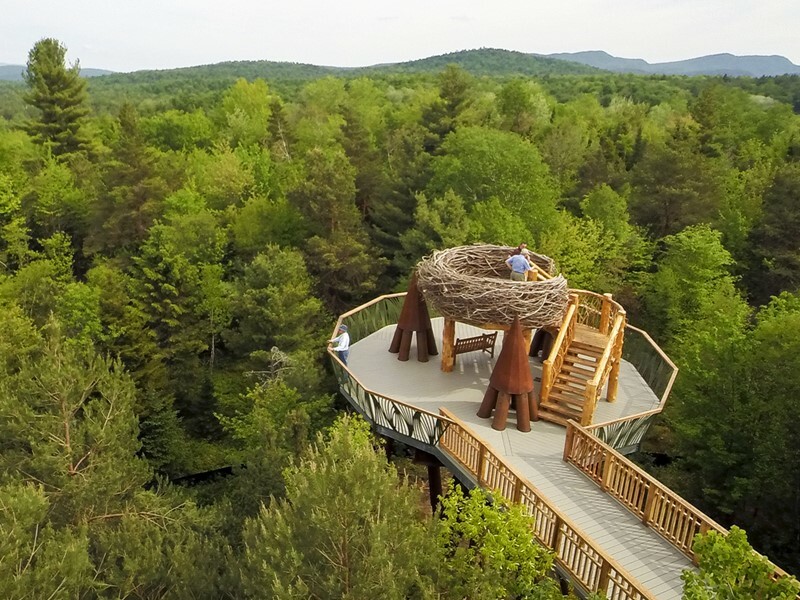 This nest, designed to give you an idea of how a bald eagle of the forest might live, is the highest point of Wild Walk and sure to delight the kids. Climb up to the nest and relax as you look out across the forest that stretches as far as you can see. 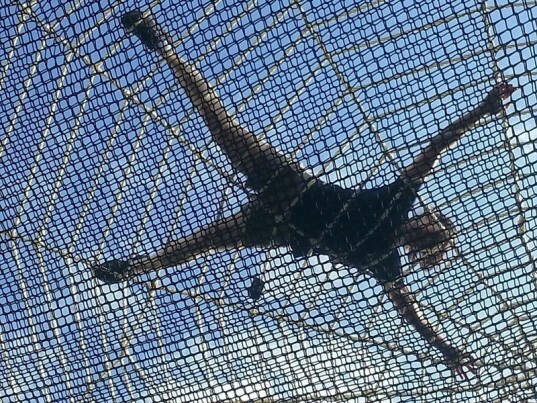 Not for the faint of heart, but sure to entice most littles is the giant spider-like suspension web. Kids (and adults) who dare to venture into the web get to find out what it’s like to live on a web, hanging on a thread above the forest. Thankfully for those of us prone to arachnophobia, no real spiders are included in the fun! The tallest trees in the Adirondacks are white pines, which are prone to lightning strikes and snapping off in gales. When this happens, the pines turn into towering trunks called snags. The Wild Walk’s snag (shown above) is a giant among the giants, big enough for a stairwell inside, and four stories tall. This amazing snag allows kids to see what it’s like to be an animal who lives in one. Beyond cool snags, nests, spider webs, and magnificent views, The Wild Center offers much more for families including a trout filled pond, canoe trip on the Raquette River, paddleboard trips, outdoor play areas, an indoor zoo where you can see myriad fish, turtles, and other animal and plant species, nature films and even a chance to get up close and personal with otters, porcupines, ravens, and snakes thanks to The Wild Center’s Naturalists. One day here is probably not enough to see all that this attraction offers! The Wild Center aims to be accessible to all their visitors. Accessibility is awesome, because as any parent with two babes in a stroller, or family with a member in a wheelchair or crutches knows, this is a true rarity among outdoor nature attractions. The Walk features cool side paths, stairs and other ways to see the treetops, but the entire main structure, from the trail leading to Feeder Alley all the way to the viewing pod on the final tower platform was built specifically so that it would afford everyone the chance to experience the Walk. The fact that Wild Walk is accessible to people of all generations and abilities makes this an attraction to add to every family’s bucket list. The Wild Center and Wild Walk are open daily from 10:00am to 6:00pm and this trip is affordable for an all-day adventure. Plan your visit by checking out the Wild Center’s website. The Wild Walk is the newest adventure at the Wild Center and it truly does allow your family to get wild. This beautiful walk takes you up, up, up high to a trail of bridges straight to the treetops of the Adirondack forest. Your family can explore the world above like they never have before, gaining a bird's eye view of nature and new perspectives on what it's like to live among the treetops. Not for the faint of heart, but sure to entice most littles is the giant spider-like suspension web. Kids (and adults) who dare to venture into the web get to find out what it's like to live on a web, hanging on a thread above the forest. Thankfully for those of us prone to arachnophobia, no real spiders are included in the fun! The Wild Center aims to be accessible to all their visitors. Accessibility is awesome, because as any parent with two babes in a stroller, or family with a member in a wheelchair or crutches knows, this is a true rarity among outdoor nature attractions. The Walk features cool side paths, stairs and other ways to see the treetops, but the entire main structure, from the trail leading to Feeder Alley all the way to the viewing pod on the final tower platform was built specifically so that it would afford everyone the chance to experience the Walk. 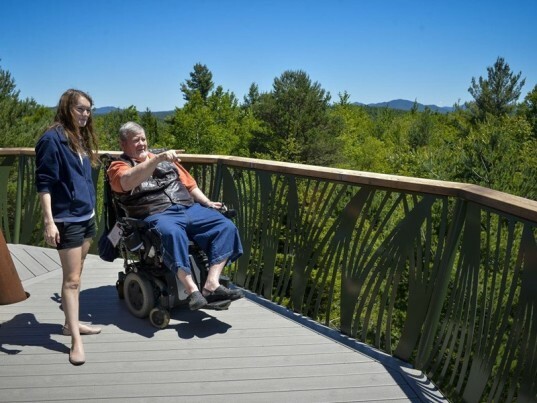 The fact that Wild Walk is accessible to people of all generations and abilities makes this an attraction to add to every family's bucket list. The Wild Center and Wild Walk are open daily from 10:00am to 6:00pm and this trip is affordable for an all-day adventure. Plan your visit by checking out the Wild Center's website.